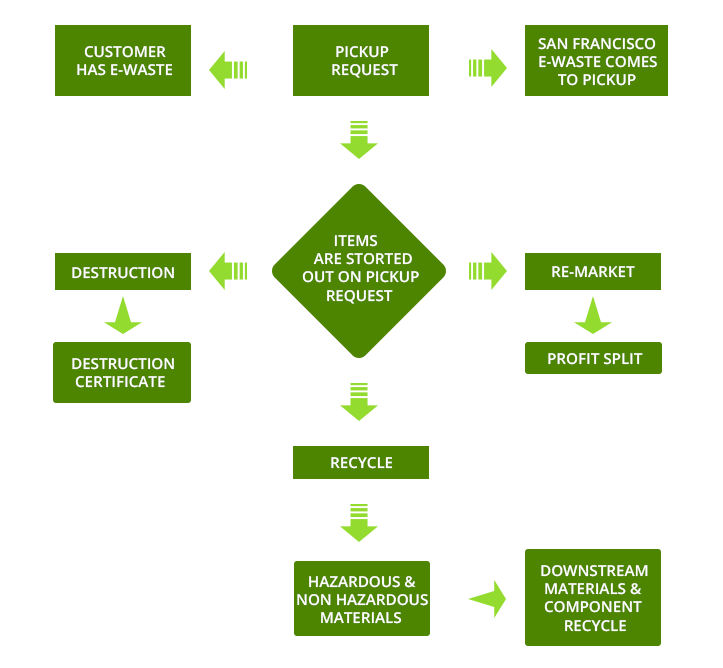 San Francisco E-waste is recognized as a top asset-recycling service provider in the Bay Area. We follow a multi-faceted strategy using the best procedures every step of the way. We ensure your investment will reap many rewards as you recover the maximum payout from your IT assets, which are declared as e-waste. Our adept and experienced team is fully-trained to facilitate proper e-waste processing and handling. They work hard to bring you the highest customer satisfaction. We will first process your request and pick up the e-waste from your specified location. Secondly, it goes through a smart-sorting process and a report is generated so that every aspect has been completed. We then assess the worth of the asset, and whether it is at the stage of destruction,recycling, or remarketing. If the asset is determined as hazardous or non-hazardous, and is deemed as potentially dangerous or toxic, it is processed as such, and will never reach a landfill. Your electronic asset(s) report will be available via download from our website. Each report details the specifics of your e-waste and the methods which we have followed. We have provided a flowchart below which will help you to understand the whole process without a glitch.